Words with Gods is an exploration of the relationship between different cultures and religion. Aboriginal Spirituality, Catholicism, Islam, Judaism, Shinto Buddhism, Orthodox Christianity, Umbanda, Hinduism, as well as Atheism find their expression in this two-hour film. Based on a concept by Guillermo Arriaga and arranged in the present order by Mario Vargas Llosa the film’s nine episodes present different perspectives on this distinctly human phenomenon. Words with Gods is directed by Spain’s Álex de la Iglesia, Australia’s Warwick Thornton, Brazil’s Héctor Babenco, India’s Mira Nair, Mexico’s Guillermo Arriaga, Israel’s Amos Gitai, Iran’s Bahman Ghobadi and Japan’s Hideo Nakata. The soundtrack was written and performed by Peter Gabriel, with animations by Maribel Martinez. With the support from the Consulate General of Mexico in San Francisco. Bahman Ghobadi was born in Baneh, a Kurdish Province of Iran, in 1969. 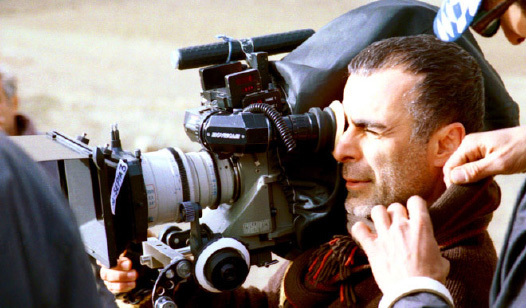 He is a director belonging to the ‘new wave’ of Iranian cinema. Ghobadi’s first feature film was A Time For Drunken Horses (2000), the first Kurdish film in the world, which won the Camera d’Or at Cannes. He followed this achievement with a number of award winning films including Turtles Can Fly (2004), No One Knows About Persian Cats (2009) and the Iraqi Kurdistan made Rhino Season (2012). In recent years Ghobadi decided to live in self-imposed exile outside of Iran. His decision was due to the increasing challenge of working in the country and the censorship under which filmmakers there now find themselves struggling to work.